In defining ‘Customer Experience’ we first need to identify who our customers are. I would argue that as a service function, which it is, all stakeholders that procurement comes into contact with could be regarded as customers – even our suppliers. While this may sound odd, we are providing services to both the buy and supply sides of the equation. Therefore, should we not treat our suppliers just as well as we do our internal customers? • Procurement managers/officers, category managers, vendor managers, contracts officers/managers, supplier relationship managers, commercial managers, procurement analysts, sourcing managers, procurement/sourcing specialists etc. • Suppliers – If you work in sales, business development or account management, dealing with procurement, then you should not miss this opportunity to learn more about where procurement is heading and how this impacts on how you relate. Seminar Stream 1A: Servant leadership for scaling Procurement’s performance. Matthew is a procurement professional with a sales and operational background. A theme of customer service therefore cuts to the core of his procurement mission, moulded from years working in a retail management role. Matthew recently accepted the role of Group Procurement Manager at the Monadelphous Group, charged with accountability for transforming the transactional purchasing function into a global strategic procurement unit to meet the needs of the company’s growing international profile. The strategic roadmap for this transformation program is rooted in the notion of “Relentless Customer Service” and pivoting toward the “Voice of the Customer”. Enterprise now requires high adaptability, collaboration, scalability and agility. We hear these terms from ExCo consistently. This means that Procurement cannot succeed in its journey toward Critical Business Partner via a mandate of rules and policies. While these are important in establishing secure purchase-to-pay governance, Procurement must also be salespeople, building and promoting solutions that appeal to the business units it serves. The evolution from Purchasing to Procurement requires a multifaceted approach synthesizing Technical Capability, Technology, Strategic Sourcing, and a clear roadmap. But the Voice of the Customer binds strategy to success. Seminar Stream 1B: Research: Could you achieve even higher savings? Luke Tindale will spark thoughts and provoke consideration that technology and it’s predictive capabilities is unquestionably disruptive and powerful, if used correctly in a procurement environment. He will demonstrate how this relates to procurement, specifically involving a Tier 1 Telco. The centralisation of a solution which standardizes, automates and supplies communication and marketing related category, is an example of how digitalisation, algorithms and API’s are totally reengineering a category and radically reducing total cost of ownership and risk associated with delivery. The next frontier in the journey for Procurement is to become s a trusted business partner. Businesses are no longer content with Procurement simply finding the right supplier at the right price. More savings must come from procurement influencing change with business partners. What does Procurement as a trusted business partner mean? What does success look like for Procurement being a trusted partner? Whether in our business or our personal lives, we have things in common with others;we have shared values, even with strangers. How do we learn what is important to our stakeholders and uncover where we have shared values for the benefit of all parties. Customer Experience Examples… The Good, The Bad and The Ugly! With the growing use of contingent labour to get the best talent and gain workforce agility for the organisation, it is not surprising contingent spend for many organisations has increased significantly over the years. To gain more visibility and ensure solid governance of this expenditure, many organisations have introduced a Managed Service Provider (MSP) for the management of their contingent labour. A successful MSP implementation and effective programme management requires the involvement of many stakeholders, vendors and workers, who are “customers” within the whole process. The success and benefits delivered by your Contingent Labour MSP Program is underpinned by consistent delivery of an excellent customer experience to all groups of stakeholders. Explore the evolving technological methods that can be used to get from the basics of spend analysis, to identifying and structuring procurement opportunities and managing supplier relationships within a condensed timeline. Statement of Work (SOW)-based services and labour account for more than 40 percent of the average company’s total workforce spend per year. While sourcing and contracting capabilities continue to mature, operational procurement, especially for services, remains a challenge. Without complete services category management, your organisation will grapple with excess spend, inefficiency and significant risk. Can you guarantee your users don’t engage non-preferred suppliers? Are you able to track time and deliverables? How do you ensure your suppliers hit key milestones? Join SAP Fieldglass and Deloitte during the 6th Annual PASA Premier ConfeX in Melbourne to learn how to streamline SOW management and drive value. Our organisations are absolutely dependent upon our providers and have been for some time. Getting the promised results has been problematic, however, and procurement is often blamed as one of the contributors. By driving cross-boundary leadership, rather than just the sourcing initiative, procurement can make an enormous difference and create lasting value for both parties. Keynote 7: Behind every successful product and service is a brilliant procurement team,… or is there? What skills are people developing in different parts of the world and why? Where does ANZ stand in relation to rest of the world? As a buyer, do you want to know whether you are on the right track in terms of personal development, whether it matters, and how you compare with your peers around the world. This is your opportunity to hear about the Global Procurement Capability Benchmark. Seminar Stream 3A: A harsh look in the mirror: Can I see what my customer sees? As an industry and as professionals we’ve suffered from a lack of self-awareness for too long. If procurement is to realise it’s true potential it’s time to stop kidding ourselves, create and take opportunities and become masters of our own discipline. By Dr Olga Rush-Latypova, PhD, MBA, CPA Lecturer in the School of Business, Innovation and Entrepreneurship Melbourne Polytechnic. , Dr Kabossa Msimangira, PhD, MBA, BA (Hons), FCIPS, ISM Senior Lecturer in the School of Business, Innovation and Entrepreneurship Melbourne Polytechnic. Perceptions of procurement and accounting personnel regarding procurement as a strategic function and its impact on organisational performance. Key procurement financial performance measures used in Australia. Seminar Stream 4C: Customers – What an interesting animal …..?! We are all consumers, therefore we are all customers. Most of us also have customers whom we happily serve (or get paid to service) – think about your stakeholders, colleagues, sure we know about those. But also think about your netball teammates, MAMIL mates, your wife or husband, your kids, your dog – are they also your customers – well? Let’s have a think about that together – I have reached out to some professionals to share some firsthand approaches with you all. This fun approach will make you relax when dealing with that difficult customer complaint, tardy colleague, untidy flatmate and naughty doggie, without losing your cool. What are some other leaders approaches? Managing efficient procurement processes and systems is entirely meaningless unless there is a clear alignment between organisational culture and leadership. Having both of these critical and compelling forces aligned can mean the difference between highly rewarding procurement performance, or dismal and utterly depressing failure – an all too common result. But what about procurement in the real world? What is poor listening costing you, your team, your organisation and your impact? How many of us rush from meeting to meeting, your head buried in the last conversation you had, without time to think of the next? How many of us feel frustrated with unproductive discussions where the loudest in the room adds limited insight and drowns out everyone else? Have you ever worked furiously on a project, only to find out you have delivered something that didn’t meet your customer/stakeholder's needs? We often think of these situations as communication problems; that we have not spoken our needs correctly or clearly. Yet, conflict, chaos and confusion such as these are the costs of poor listening. Join me to gain insightful tips on how Deep Listening can improve your customers experience. Keynote 8: Small Company, Big Business - The things you didn't know your suppliers are saying about you. When big companies engage small suppliers, procurement sees 3 main issues that cause problems. What is interesting is that your suppliers see exactly the same problems…..but from a different point of view? Health Purchasing Victoria (HPV) commenced a customer-focused strategy in 2017 to improve health service engagement and better understand their needs. A year on, this collaborative approach has delivered significant value to HPV and its customers. The journey has shown that genuine and personalised customer engagement increases stakeholder buy-in to the benefits of HPV collective sourcing, supporting procurement and probity practice improvement and best-value healthcare outcomes in line with HPV objectives. The procurement team is using ‘agile’ methodologies to run a procurement process to select a technology partner for Watercares strategic transformation project. The use of agile delivery for the implementation phase, which has meant role modelling behaviours and ways of working to the business and vendors to set them up for the delivery phase, has resulted in unusually high levels of engagement, collaboration and innovation with both internal stakeholders and suppliers. How this shift in thinking was communicated to both stakeholders and suppliers though the STP procurement process. This session looks at social procurement from the perspective of a buyer and a social enterprise supplier. A CEO and CFO hypothetically discuss the CPO’s internal performance, before inviting the CPO to join the meeting. Can the CPO convince the CEO and CFO of the veracity of his internal challenges and enlist their support for the help he needs?. Seminar Stream 6B: What do our customers expect with the introduction of procurement technology? Lecturer in the School of Business, Innovation and Entrepreneurship Melbourne Polytechnic. Senior Lecturer in the School of Business, Innovation and Entrepreneurship Melbourne Polytechnic. The PASA Premier Confexes will bring together the largest audience of procurement professionals in the region. In terms of generating direct sales opportunities, no other event provides you the opportunity to engage with such a broad spectrum of professional buyers, over two days, in one place. As a sponsor, no other event provides you the opportunity to expose your brand and message to such a large audience over such an extended promotional period. 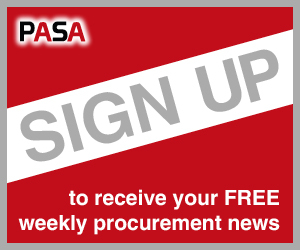 If you want to engage with the professional procurement community then the PASA Premier ConfeX provides you with the best possible platform.